It’s corn season. I hope you’ve been grabbing those husked cobs on the shelves because now is the time to enjoy. 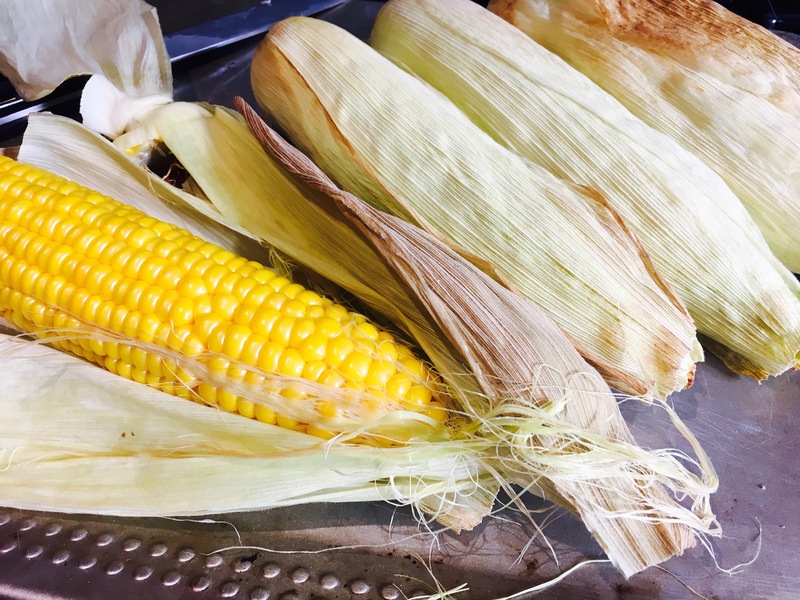 The best way to eat fresh corn in season is of course to simply throw it in the oven – husks and all – and bake for about 20-30 minutes. The silk and husk prevents the corn from drying out, and you’ll be left with the unadulterated perfection of sweet, juicy corn on the cob. You can see in the photo how well the kernals retain their moisture using this method. 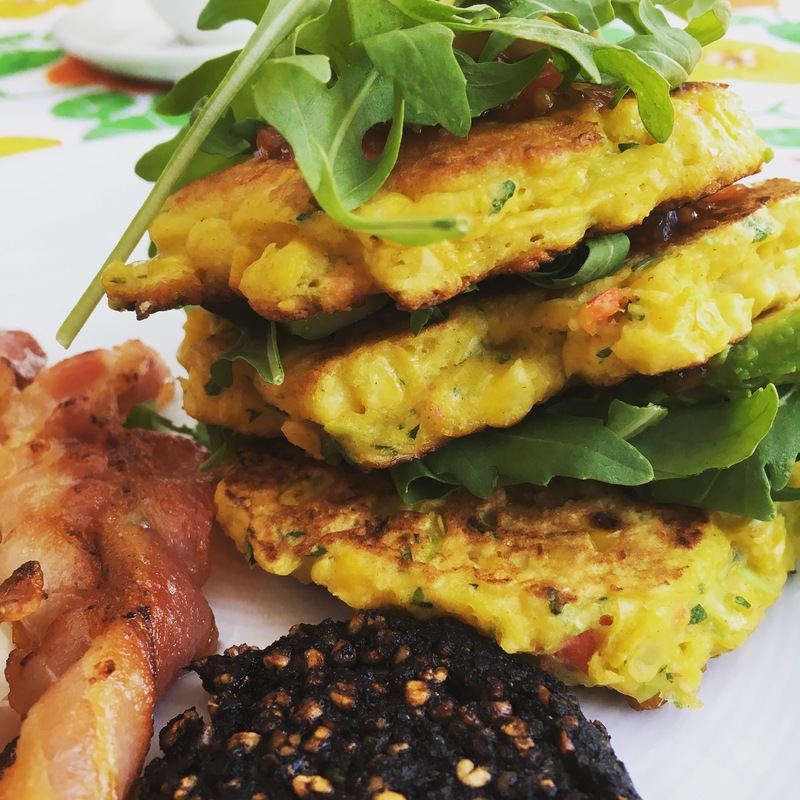 But if you’re look for a delightful brunch idea, here’s a recipe for corn fritters that has been tried and tested and features prominently in my recipe journal. Serve them up in a stack, layered with fresh slices of avocado, tomato chutney and rocket and for good measure, fry up some bacon or black pudding to go with. I know it might seem a bit fiddly to blitz the ingredients but it’s worth it. And don’t you dare remove the corriander, because that’s the star of this show. Notice I’ve added rice flour to the mix, now this is optional because most people don’t have rice flour in the cupboard. I use it on the advice of a friend who says it gives fritters a nice crispy outside. You will be able to pick some up at most Asian grocery stores. And if you’re wondering which black pudding features in the photo – it’s Clonakilty. By FAR the best in the land. Blitz the kernals of one cob together with the onion, egg, chilli and herbs. In a bowl put the kernals from the other cob and mix with dry ingredients. Now add the blended wet ingredients to the dry ingredients and mix. Fry in a pan with some olive oil on medium heat to ensure they cook all the way through. Only flip when they’re almost cooked through, it’ll prevent them from sticking to the pan.